The Humans of Shadow Era has been consider the stronger faction of the Warrior Class. Boris and Amber have long sat as some of the stronger heroes of both Call of the Crystal and Dark Prophecies. Shatter Fates bring newcomer Tala into the mix and she see tons of play with her unique ability. •Boris Skullcrusher – 4SE: Target opposing ally with cost 4 or less is killed. •Amber Rain – 3SE: Target weapon you control gains +2 base attack, but may not gain any other bonus. •Tala Pureheart – 3SE: Target friendly ally gains protector, +1 base attack and +1 health. 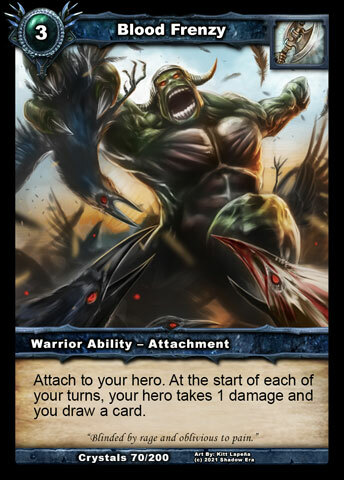 •Braxnorian Veteran (4cc – 3/4) When Braxnorian Veteran is summoned, you may return target Warrior attachment in your graveyard to your hand. •Fleet-footed Messenger (3cc – 1/5) Haste (This ally can attack and use ability in the turn he is summoned) 1: Target card in your hand is shuffled into your deck and you draw a card. •Lily Rosecult (4cc – 3/4) When Lily is summoned, return the top item from your graveyard to your hand. •Tainted Oracle (4cc – 2/2) When Tainted Oracle is destroyed draw 2 cards. •Mystic of the Vale (4cc – 2/6) 2: Target attachment is returned to its owner’s hand. 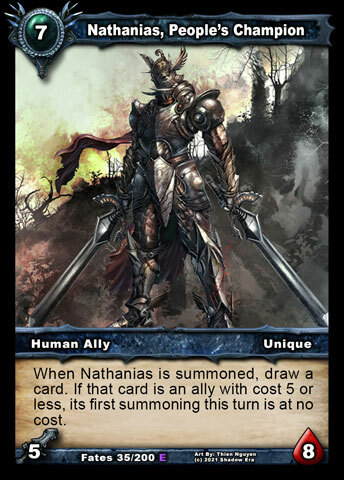 •Nathanias, People’s Champion (7cc – 5/8) When Nathanias is summoned, draw a card: if that card is an ally, it is summoned at no cost; otherwise, it is discarded. •Shrine of Negatia (1cc) Return target item with cost 4 or less to its controller’s hand. •Retreat! (2cc) Put target ally back into its owner’s hand. •Campfire Stories (2cc) All of your allies heal 2 damage. Draw a card. •Disrupt Aura (2cc) Target attachment is returned to its owner’s hand, and the hero of ally it was attached to takes 1 damage. •Glimmer of Hope (2cc) Draw 3 cards and discard 2 of them. •Road Less Traveled (3cc) Target ally is returned to its owner’s hand: that ally’s owner draws 2 cards. 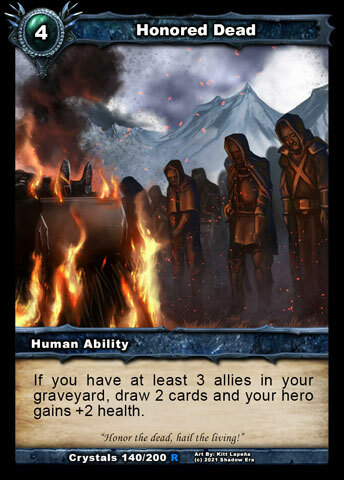 •Honored Dead (4cc) If you have at least 3 allies in your graveyard, draw 2 cards and your Hero gains 2 health. •Blood Frenzy (3cc) Ongoing: Your hero takes 1 damage and draws an extra card each turn. •Treasured Heirloom (3cc) Target friendly ally has +1 attack while Treasured Heirloom is attached. When Treasured Heirloom is destroyed, you draw 2 cards. •Scriptures of the Righteous (2cc – 4d) 1D: If an opposing hero or ally was dealt arcane damage this turn, draw a card. 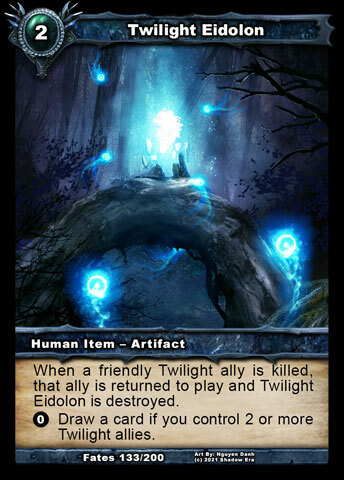 •Twilight Eidolon (3cc) When a friendly Twilight ally is killed, that ally is returned to play and Twilight Eidolon is destroyed. 0: Draw a card if you control 2 or more Twilight allies. 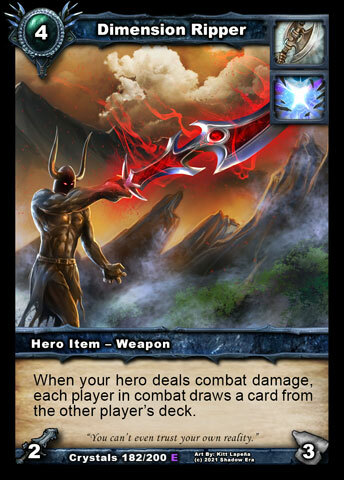 •Dimension Ripper (5cc – 2/3) When your Hero deals damage, each player draws a card from the other player’s deck. Tagged amber, Amber Rain, boris, Boris Skullcrusher, human, Sf, Shadow era, shattered fates, tala, Tala Pureheart, warrior.